We checked online to see how many types of coffee beverages there are… it turns out, there’s quite a lot. Over thirty different types were listed on one website, and more than forty on another. 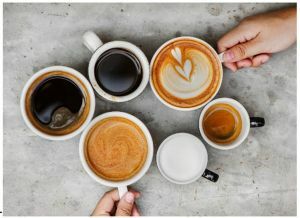 To save us all some time, we will confine this list to the most commonplace coffees available, and what many Canstar Blue staff deem the most delicious. Did we forget your favourite type of coffee? Let us know at enquiries@canstarblue.co.nz and we’ll add it to the article! The two most Kiwi coffees available are the long black and the flat white – as both originated in New Zealand and Australia. For a flat white, the steamed milk from the bottom of the jug (which is usually not so frothy, but rather creamy) is poured over a shot of espresso. It is now popular among mums and dads at school fetes who are desperately trying to stay awake. A macchiato is a shot of espresso which is then topped off with foamed milk dashed directly into the cup. Although it may sound similar to a cappuccino, it’s usually stronger as there’s no steamed milk added and it’s also smaller, usually served in an expresso sized cup. Too many of these and you might have to ‘just crash here, bro’, because this type of coffee is brewed with whiskey, sugar, and a thick layer of cream on the top – and isn’t readily available in New Zealand Café’s due to its alcohol content, they’re more often found in restaurants. Be warned that trying to make this with scotch and instant coffee doesn’t work… trust us.